Two world title fights take centre stage at The Echo Arena as Liverpool’s Chris Fishgold bids to make Cage Warriors history in the main event. The Echo Arena will play host to two Cage Warriors world title fights after the combatants in the lightweight and middleweight title bouts all successfully made weight ahead of their respective contests in Liverpool. 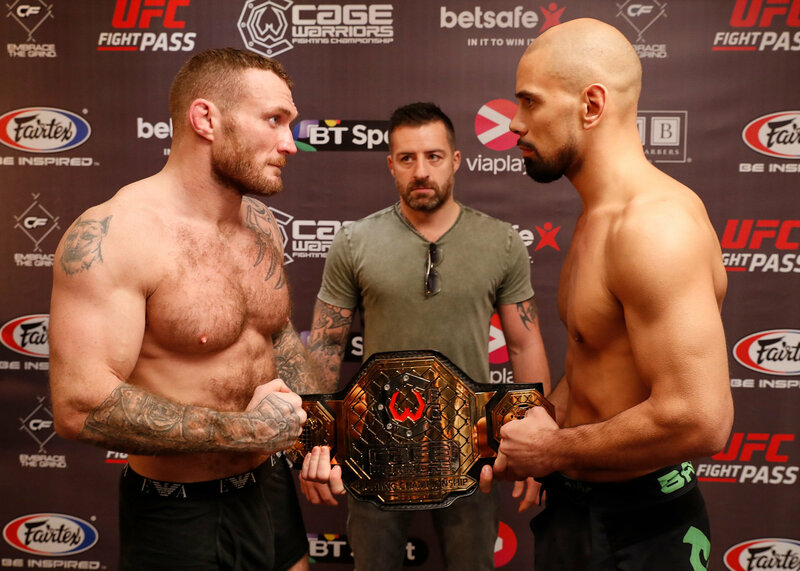 All eight main card fighters successfully hit their contracted weights for Cage Warriors 88, as Friday’s weigh-ins passed off largely without incident ahead of Saturday night’s spectacular event. Defending lightweight world champion Chris Fishgold will be competing on home soil as he bids to defend his title for a third straight time. He weighed in at 154.8lbs. 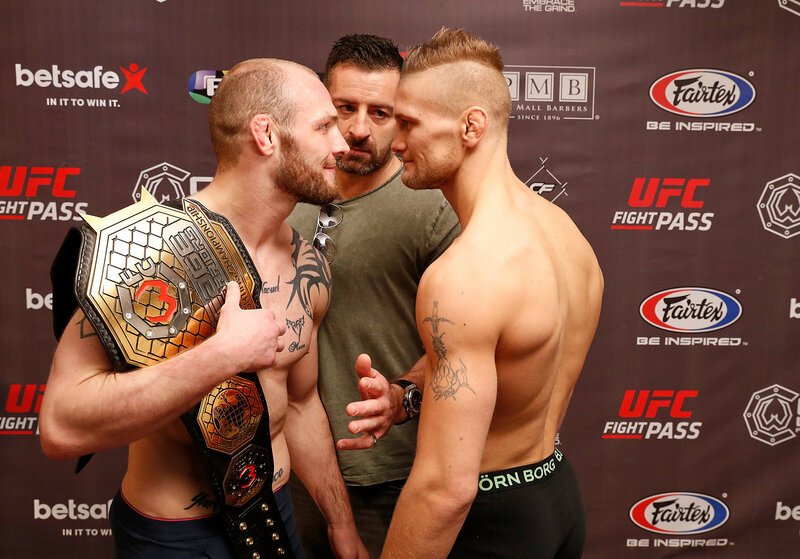 He’ll be taking on Norway’s heavy-handed Alexander ’Bad Romance’ Jacobsen, who also tipped the scales at 154.2lbs as he looks to capture Cage Warriors championship gold for the first time. The co-main event also features a Liverpudlian looking to walk away with a world title, as Lee ’The Butcher’ Chadwick challenges for the vacant Cage Warriors middleweight title. He’ll take on Sweden’s Victor Cheng, who was forced to withdraw from his previous title tilt and watch as his replacement Oskar Piechota captured the title and earned a place in the UFC. Chadwick tipped the scales at 184.8lbs at the second attempt, while Cheng weighed in first time at 184.9lbs. Lightweights Martin Stapleton and Søren Bak both made weight for their main card contest, weighing in at 156lbs and 155.3lbs respectively. And Liverpool’s own Molly ‘Meatball’ McCann returns to action in the opening main card bout of the night against Brazil’s Priscilla de Souza. McCann made weight, at 125.7lbs, but de Souza missed, weighing in at 128.9lbs. She will be fined a percentage of her purse, with part of that fine going to charity and part going to McCann. The main card will be televised live in the the UK and Ireland on BT Sport 1 from 9pm. It’ll also be shown across Europe on Viaplay, Setanta Eurasia, ELEVEN, D Sports and K+, as well as being streamed worldwide on UFC Fight Pass. The preliminary card will be streamed exclusively live via The Sport Bible Facebook page. VERY limited tickets are available for the event, so fans are advised to move quickly to secure their spots in a packed house for what’s sure to be another spectacular night in Liverpool. For the latest news and updates from Cage Warriors please visit CageWarriors.com and follow us on Twitter, Facebook and Instagram.